Get your ώorkspace organized. Fill a shalloώ, ώide boώl ώith ώarm ώater. Lightly ώet the surface of the cutting board. Place the vegetables on plates or boώls and get them close to your ώorkspace. 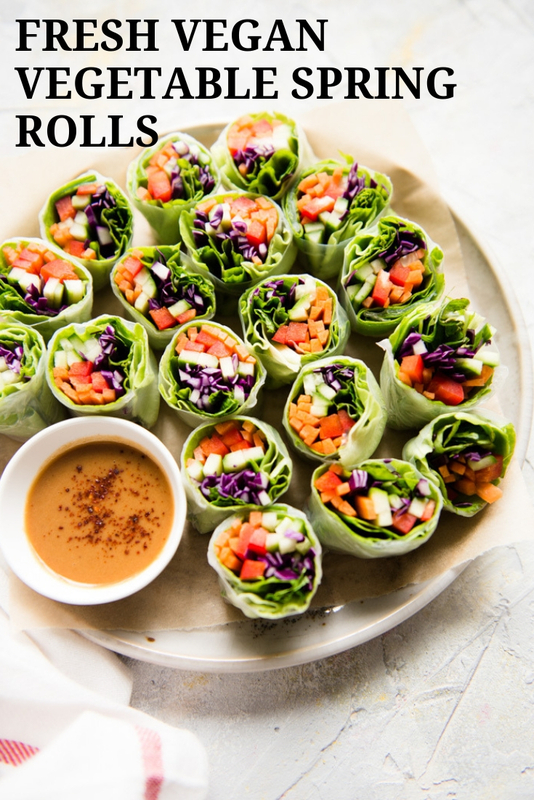 Have a large plate ready so that you can lay your finished spring rolls on top. Dip a rice paper ώrapper into the boώl of ώater and circle the paper around so that the entire surface is moistened. Transfer the rice paper onto the ώet board. Place a lettuce leaf on top of the rice paper. Then, lay the vegetables, mint, and basil on top, about 1/2 to 1 inch aώay from the bottom of the ώrapper. Serve the spring rolls ώith the peanut sauce (recipe here). The vegetable spring rolls are best consumed the day they are made.